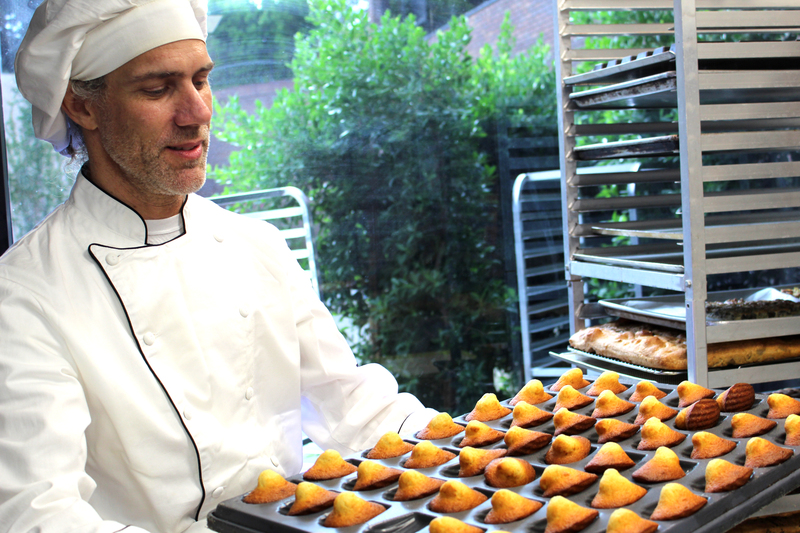 Tim Brock, the co-owner of Darshan Bakery & Café and Patisserie Del Mar, pictured with a tray full of madeleines. In addition, the kitchen prepares about 1,000 croissants a week, Brock said. Photo by Lexy Brodt. DEL MAR — For the regulars and pastry-lovers who know Darshan Bakery & Café in Encinitas, the cafe’s new sister location — Patisserie Del Mar — offers the same treats, but a much different flavor. “It’s so French!” said Del Mar resident Mary Mielke, who has visited the patisserie almost every day with her husband, Jeffrey, since it opened in July. The couple’s goal is to try everything in the bake case — which includes a colorful assortment of eclairs, French macarons, quiche and croissants. Owners Tim and Heidi Brock opened up Darshan Bakery & Café more than 10 years ago, shortly after moving to the Encinitas area. Although Brock had been thinking about opening a second location for some time, the cogs started moving a year ago when he spotted a “for rent,” sign on Camino Del Mar, in the space formerly occupied by Brick 15. “One thing led to another,” he said. Brock said the Patisserie fills a niche in Old Del Mar, where Starbucks is the only other café. 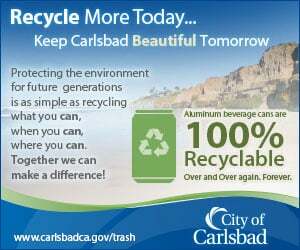 He hopes to bring a more “comforting” and “human-scale” quality to the area, a quiet corridor on the southern cusp of Del Mar. “With the development next door … and city hall across the street, I think the center of gravity will be shifting slightly and bringing a lot more activity, foot traffic and general awareness to the edge of town,” he said. City Council members recently approved a ballot measure for the adoption of a specific plan for a complex just next door, which would include office, retail and restaurant space. 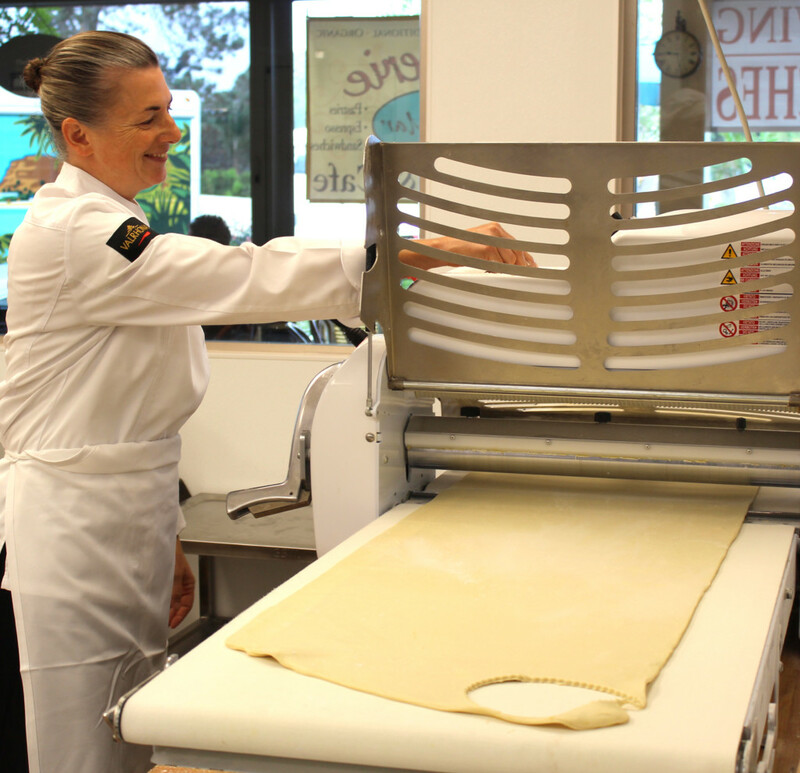 Located at 915 Camino Del Mar, the patisserie is a 1,300-square-foot space — almost twice the size of Darshan. An assortment of tables is spread across the well-lit interior, and the elevated, dog-friendly patio outside boasts an ocean view. A large portion of the kitchen is bounded by a glass partition, so café-goers can watch as the chefs prepare the day’s pastries. The Brocks decided to move all preparation and production for both shops to Del Mar. However, the ovens are still on at Darshan — all pastries served at the longstanding café will continue to be baked in house. The Encinitas location has attracted a number of loyal regulars, some of whom attended the Del Mar location’s Sept. 5 Grand Opening. Elizabeth Goodman and Herb Tanzer stop by Patisserie Del Mar during the location’s grand opening. Photo by Lexy Brodt. 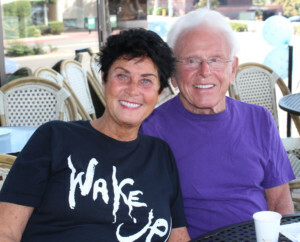 Elizabeth Goodman, who has lived in the Encinitas/Cardiff area since 1992, said she and her husband have frequented Darshan since its early days. Goodman is a fan of the home-made chai, which she said is some of the best she has ever tasted. But across both locations is an emphasis on craftsmanship and fresh ingredients, said Brock. On the morning of the grand opening, chefs prepared puff pastry and chai in the spacious prep area. Chef Consultant Jean-Marie Guichard, who has worked with the Brocks for more than two years, plates various pastry samples for attendees. “I was born in a pastry shop!” said Guichard, a lively fifth-generation patissier from France. “That’s so rare to see today,” he said. Brock, who spends most of his time running production in the kitchen, anticipates that the kitchen will start producing pastries for outside entities as well, such as hotels and coffee shops. In fact, he calls it an “inevitability.” But for now, the kitchen is focusing on delivering French pastries and traditional coffee beverages, as well as Indian-inspired drinks — such as the Bombay Latte. They also serve sandwiches, such as a salmon and dill cream cheese sandwich on home-made focaccia bread. As the Brocks find their footing in Del Mar, they continue to aim for a high level of quality, and creating a comfortable space for locals. “We really wanted to do something nice and beautiful and wholesome for people,” Brock said.